Lake City ammunition is produced on the same assembly lines that supply the US military. 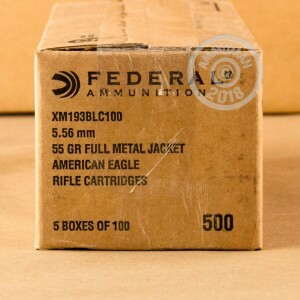 Sold as surplus on the commercial market under the Federal brand, these cartridges are a favorite target load for countless AR-15 owners around the country. 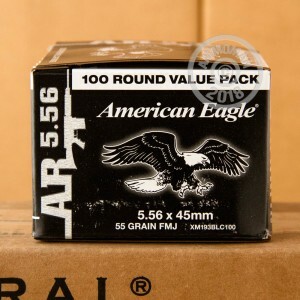 This particular ammo follows the M193 standard and fires a 55 grain full metal jacket at about 3,240 feet per second. Each round features a boat tailed profile for enhanced accuracy at extended ranges. 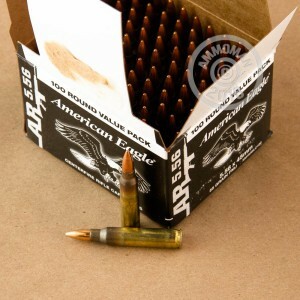 Like other Lake City production, this ammo uses non-corrosive Boxer primers and brass cases with visible annealing. The Lake City Army Ammunition plant in Independence, Missouri is operated under contract by Alliant Techsystems, the parent company of Federal Premium Ammunition.